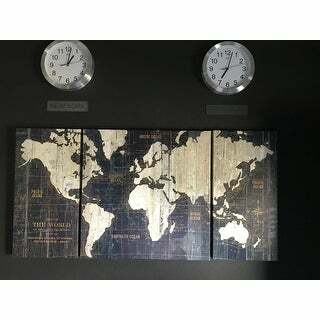 Love this set for our living room. It is a little tricky to hang three canvases and make sure they are level and lined up but the end product is pretty lovely. Overall, very happy with this purchase. Taking inspiration from both glamorous designs and vintages-inspired looks, this stylish wrapped canvas print brings a pop of chic style to any room in your home. 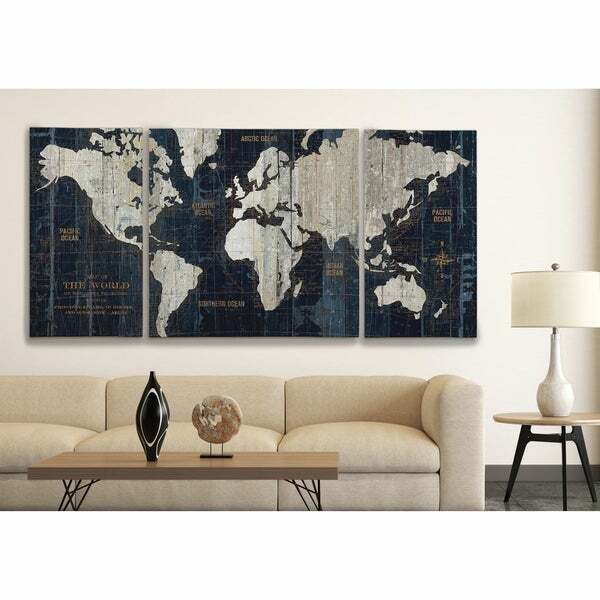 Showcasing a map of the world motif, this piece's distressed details add an antiqued touch to your decor, while its silver, black, and blue color palette is perfect set against a crisp white wall for an accentuating look. 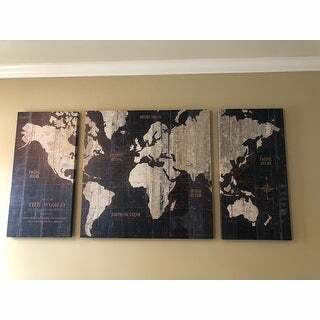 Hang this design above your master suite bed for a wow-worthy focal point, or use it as a centerpiece to your global glam gallery wall. Dimensions 40.0 In. X 80.0 In. X 1.5 In. I bought the 24" X 48" for $ What a deal! It was a bit tricky to hang being a triptych and the lines in the middle piece (lower right) don't exactly match up perfectly but you'd have to study it for quite some time to notice. Could also be the way it was hung - I'm not professional art hanger. Overall it is an appropriate piece appealing to most and fills up the office wall space nicely. Great buy! 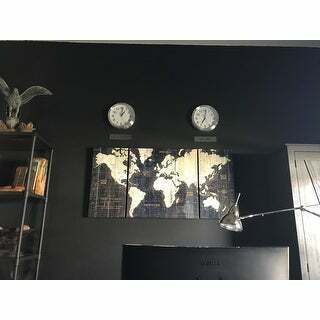 I ordered because I needed something large and dramatic for an office wall. Wow, I love the pieces and their colors! Navy, denim and grays predominate the colors but the gold lettering and small streaks of rusts and reds give it real depth. I would not recommend this product when it arrived it looked nothing like the one representing the one on the website. The art was not distinct or sharp and you could not make out the maps it was supposed too. 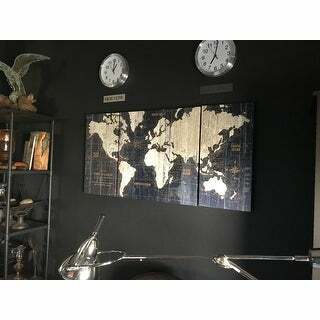 Great buy for the price, true to picture, and looks great in our study. I just wished there was more details and gold color in the picture. Note it is difficult to hang up evenly so make your measurements before hand. Love!!! Perfect size..as pretty as the pic!! Colors are great! Great price too!! Loveeeee Overstock!!! You have everything at a great price!! Everyone loves it. We're hanging over the kitchen table its become a point of interest. I love the look! Love the colors and the distressed texture!